Starz announced today that the network has issued a two-season renewal for Outlander Season 5 and Season 6, while also revealing that Season 4, which is currently in production, will debut in November. 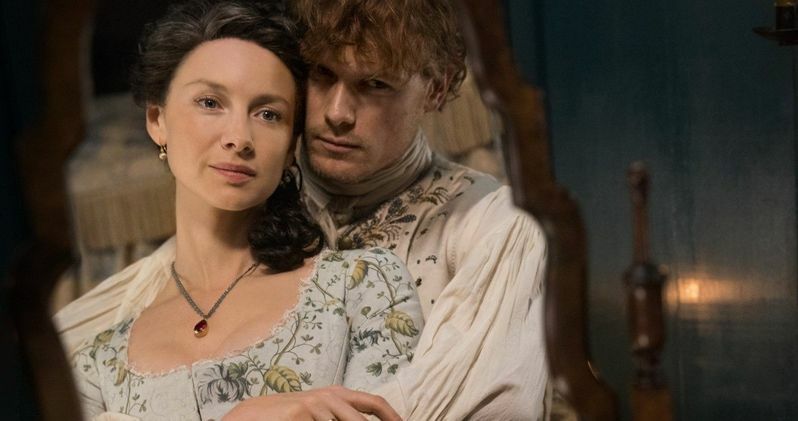 While no exact date in November has been revealed for the premiere date yet, the network did unveil new photos offering fans' first look at Claire (Caitriona Balfe) and Jamie (Sam Heughan) in this upcoming season. Here's what Starz CEO Chris Albrecht had to say in a statement about the renewal. "Fans can rest assured their beloved Claire and Jamie will be back facing new challenges, adversaries and adventures in seasons five and six as we delve into American history and continue the story of the Frasers as they settle in the New World." Along with the returning Caitriona Balfe and Sam Heughan, Outlander Season 4 will feature a number of new characters as well. It was announced in October that Maria Doyle Kennedy (Orphan Black, The Tudors) has come aboard to portray Jocasta, the strong-willed aunt of Jamie, and Ed Speleers (Wolf Hall, Downton Abbey) playing a pirate and smuggler named Irishman Stephen Bonnet. No further casting details have been given on the fourth season, which started filming in Scotland back in October. The third season picked up after Claire returns to her normal life in 1948, although her return isn't exactly a welcomed one. Since she returns to 1948 pregnant with Jamie's child, it puts a heavy strain on her marriage to Frank (Tobias Menzies). In the 18th Century, Jamie is suffering as well, after his defeat at the Battle of Culloden, while also pining for Claire. While both try to make separate lives for one another, they finally reunite half-way through Season 3, in an extended 74-minute episode that showed Jamie and Claire back together again after 20 years apart. Season 4 will be based on the fourth book in Diana Gabaldon's critically-acclaimed novel series, the 1996 book Drums of Autumn. This book follows a reunited Claire and Jamie, who try to make a new life for themselves in the American colonies, picking up where the third book left off, with Claire and Jamie shipwrecked off the Georgia coastline in the year 1766. The book follows Claire and Jamie as they head north up the Atlantic coastline, eventually settling in the foothills of North Carolina. The cast of Outlander also includes Duncan Lacroix as Murtagh Fitzgibbons Fraser, Gary Lewis as Colum MacKenzie, Graham McTavish as Dougal MacKenzie, Lotte Verbeek as Geillis Duncan and Tobias Menzies in the dual role of Frank Randall and Jonathan "Black Jack" Randall. The show is based on Diana Gabaldon's novel series which has sold more than 28 million copies worldwide. Series creator Ronald D. Moore serves as executive producer with Maril Davis, Matthew B. Roberts, Toni Graphia, and Andy Harries also serving as executive producers of Outlander. The show is produced by Tall Ship Productions, Story Mining & Supply Company and Left Bank Pictures in association with Sony Pictures Television. Take a look at the new video and photos from the new season of Outlander, courtesy of Starz Twitter.